BRUSSELS, Belgium, February 9, 2011 (ENS) – The need to shift economies onto a lower carbon route and to acknowledge the direct links between the resilience of ecosystems and that of national economies were highlighted by the Prince of Wales at today’s opening of Parliament’s Low Carbon Prosperity Summit. 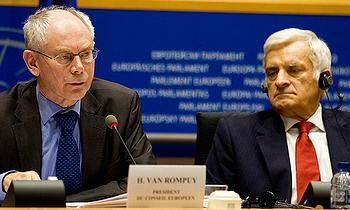 European Parliament President Jerzy Buzek, Commission President Jose Manuel Barroso and European Council President Herman Van Rompuy all advocated using low-carbon technologies to build prosperity. “Success will be in building low-carbon industries that provide not only substantial economic opportunity, but also a means to ensure Europe’s competitiveness,” said the Prince. Prince Charles proposed tackling climate change while maintaining economic viability by valuing and supporting local communities, adopting policies that focus funding on strengthening diversity, and promoting effective public-private partnerships. 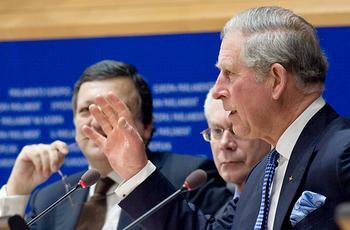 The Prince advocated “achieving stringent energy efficiency targets for our buildings, cars and household goods” and said that economic growth should be decoupled from ever greater environmental destruction. “Since 1990, we have reduced greenhouse gas emissions in the EU by more than 10 percent, while our economies have grown by about 40 percent,” Barroso said. 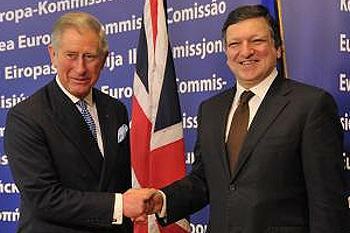 Barroso underlined the need to get framework conditions right for investment and highlighted the benefits of low-carbon technologies. He also noted that despite progress already made, “it is not time to take our foot off the accelerator,” adding that a new set of targets will be endorsed for 2050. President of the European Council Herman Van Rompuy, called for a “revolution in energy systems,” noting that a large part of the latest European Council, on February 4, had been devoted to energy.